While we just looked at an example of how walking speed changes with change in trail steepness, it is also interesting to look at how vertical ascent rate (VAR) changes with trail steepness. 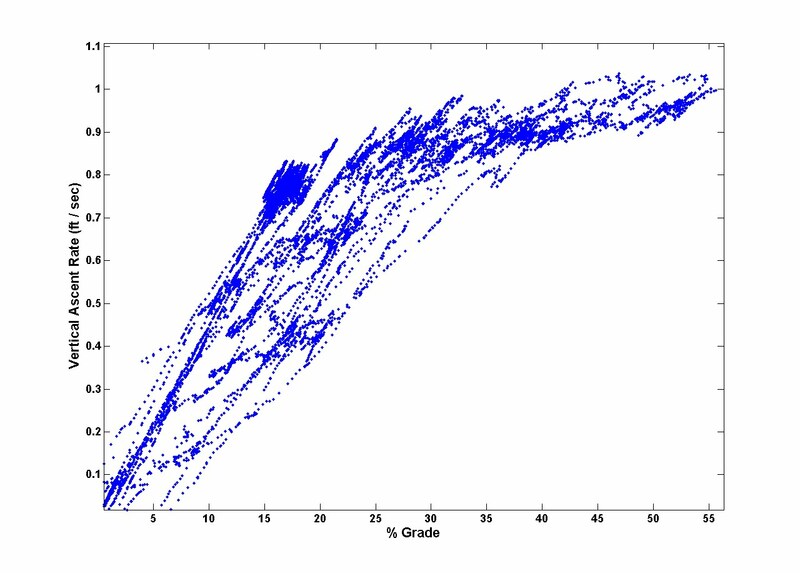 Of course, I think most people would generally hypothesize that VAR increases as the grade increases, since a larger % of energy will be spent on vertical movement. I would also hypothesize that above some grade (perhaps 60-70%), VAR would begin to decrease - I am thinking about loss of friction, change in terrain, and change in biomechanical efficiency - but that is simply conjecture at this point. We will look at only one exemplar hike (Big Iron again) which is suitable because of the breadth of gradients encountered and I was attempting to hike at a constant pace. 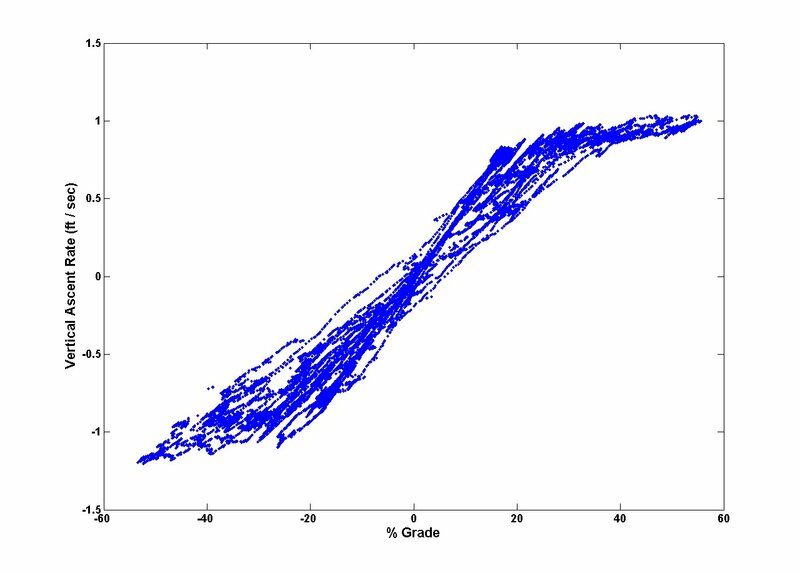 Below is a plot of VAR vs grade % (this time I multiplied by 100% so it makes more sense, like 15% grade on a treadmill). We can confirm in this case that VAR increases as grade increases. We see a similar pattern while going downhill as well, although the vertical descent rate appears to be slightly faster at each grade. We see VAR increasing rapidly as grade increases from 0 to 15%. 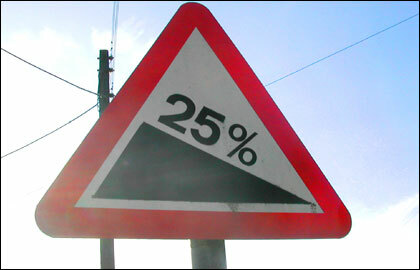 From 15% and up, the VAR still increases but at a smaller rate. The variability also decreases with increasing grade. VAR from 0-15% could be increased nonlinearly if a person was running - as mentioned in the previous post - for me walking under 15% grade reduces energy expenditure. However, since we are discussing hiking, this sort of graph is what we generally would get. The increase in VAR from 20 - 50 % does not seem that great. perhaps from 0.8 to 0.9 ft / s, but it is in reality a decent difference, leading to a difference in 360 ft / hr. This data cannot really discuss what happens at really steep slopes. I thought perhaps the looseness of the terrain could possibly affect VAR around 50%, but perhaps the grade needs to be higher for any effect to be seen. But the VAR certainly does seem to be slowing down. Of course, the absolute values here are affected by pace, altitude, terrain, weight, etc..., but a decent trend emerges. I have looked over graphs for a whole bunch of hikes and see a similar trend. In the future it would be nice to overlay different hikes, if they are controlled and say only vary in the altitude. For trail design purposes, I'd think 20-25% grade trails would certainly lead to high enough VAR for anyone while getting a good workout if so chosen. Hyperventilation - Does it do any good?